The limud of Daf Yomi assumed a particularly forward looking focus as the lomdim celebrated the Siyum of Maseches Zevachim, a large and complex Masechta – and the gateway to Seder Kodshim. The Siyum, arranged and internationally broadcast by the Daf Yomi Commission of Agudath Israel of America, was held on Wednesday evening Av 27 5778 at Camp Agudah in Ferndale, NY. Approximately 150 talmidim in Camp Agudah’s Masmidim program packed the Bais Medrash to celebrate this simcha, which was personal to them. 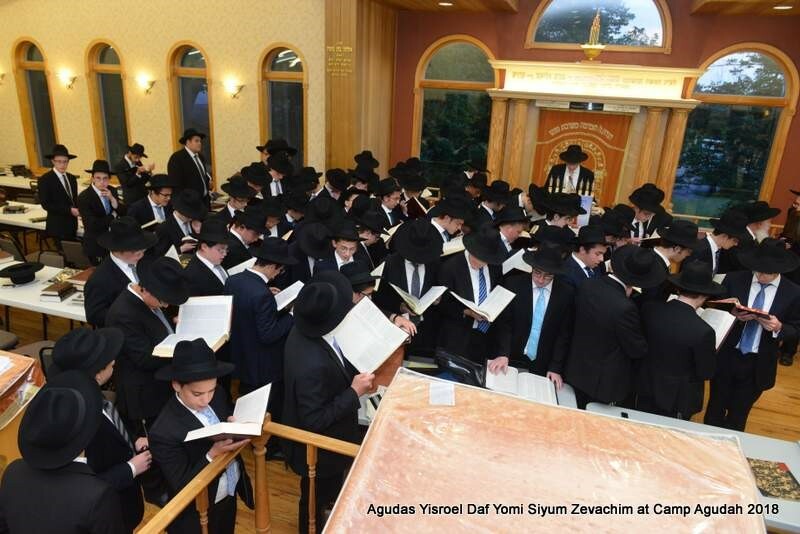 The Daf Yomi Siyum coincided with a momentous Camp Agudah Siyum HaGadol, where nearly half of the Masmidim were mesayem between one and three Masechtos each. “We are celebrating together with klal Yisroel,” exclaimed Rabbi Dovid Frischman, Director of Machane Ephraim at Camp Agudah. The current Daf Yomi revolution – with tens of thousands of lomdim across the world – began when HaRav Meir Schapiro zt”l presented the idea at the Agudath Israel Knessiah Gedolah in Vienna nearly a century ago. Generation after generation, cycle after cycle, the limud of Daf Yomi has grown and advanced exponentially, primarily through the resources and support of Agudath Israel of America and its Daf Yomi Commission. The 12th Siyum Hashas, held six years ago at MetLife Stadium, shattered all records, with 93,000 yidden joining to celebrate. Having now concluded Maseches Zevachim in the 13th cycle, the upcoming Siyum Hashas is just under one-and-a-half years away – with an even larger and more monumental celebration expected, b’ezras Hashem. Rav Elimelech Belsky shlit”a, Rosh Machane Ephraim at Camp Agudah, addressed the talmidim. He expounded upon the thoughts of his legendary father, HaRav Yisroel Chaim Belsky zt”l, Rosh Yeshiva Torah Vodaath, who led the Masmidim program for decades, about the chashivus of learning even one word of Torah. Ephraim Kramer recited the Hadran on Maseches Yevamos, representing his fellow Masmidim and the various Masechtos they cumulatively learned. After Kaddish, the Bais Medrash erupted into lively dancing, with music by Yitzy Bald. 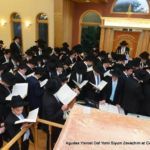 All eyes then turned to the broader simcha of the Siyum on Maseches Zevachim, and the broad international audience participating in the event by phone, at one of the dozens of satellite locations, or online. Rabbi Heshy Wolf, a longtime Daf Yomi Maggid Shiur and member of Camp Agudah’s Hanhala, recited the Hadran. Rabbi Eliyahu Simcha Bamberger, National Director of the Agudath Israel Daf Yomi Commission, thanked Camp Agudah for graciously hosting the beautiful event, and welcomed Rav Shlomo Feivel Schustal shlit”a, Rosh Yeshiva Tiferes Yerachmiel of Lakewood, who traveled a long distance to grace and address the Siyum. Rav Schustal was visibly moved at the sight. Recounting the relatively small, low scale Siyum Hashas of his youth, he reminisced about how much Torah has grown and advanced in the limud of Daf Yomi, Camp Agudah, and beyond, over the past half-century or so. “Achshir dara, the generations have improved,” the Rosh Yeshiva repeatedly exclaimed. Addressing the large audience of businessmen and professionals who are dedicated Daf Yomi lomdim, Rav Schustal cited the profound words of the Chayei Adam in his hakdama to Sefer Chochmas Adam. The Chayei Adam was a businessman who frequently traveled, yet he reached unique greatness in Torah. The Chayei Adam attested that even when traveling and engaged in business activities, “daati aleha – my mind is on learning.” Rav Schustal explained that this is the key to succeeding in the limud of Daf Yomi, and ensuring that the Torah learning has a profound spiritual impact on the lomeid. Marveling at the compounding advancements of Daf Yomi and Camp Agudah – America’s longtime trailblazer in chinuch habanim during the summer months – Rav Schustal was brimming with optimism at the future of Torah and Daf Yomi. “We’re ready for the next leap,” he exclaimed.